August 14, 1988 saw the inauguration of the first new streetcar line in New Orleans since 1926. The Riverfront Line used a section of standard gauge track that was no longer needed by the freight railroads that were running on the shores of the Mississippi River. As configured for the streetcar service, the line ran from Esplanade Ave. on the downtown (downriver) end to Julia St. at the uptown end, with a single passing siding near the middle of the line between Conti and St. Louis Streets. 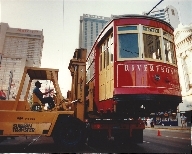 In order to provide streetcars for the new line, the New Orleans RTA had to locate and acquire a few of the streetcars which had been disposed of when the Canal line was discontinued in 1964. A fan group called Bring Our Streetcars Home (BOSH) was organized for this purpose. They were successful in acquiring for the RTA three Perley Thomas streetcars, numbers 919, 924, and 957. Later, another car, number 952, was also acquired. Federal law, in the form of the Americans with Disabilities Act (ADA), demanded that at least some vehicles on the new streetcar line be handicapped accessible. Rather than cut wheelchair doors into the reacquired antique cars, RTA purchased three streetcars which already had doors that were suitable for wheelchair access. Gales Creek Enterprises in Oregon sold RTA three class W-2 cars imported from the Melbourne and Metropolitan Tramways Board in Melbourne, Victoria, Australia. These cars had been built between 1926 and 1930, not long after the Perley Thomas cars. Gales Creek was to paint them and make some body modifications to RTA's specifications. Pictures 20 through 27 and 27.5. Moving the “new” Riverfront cars from Carrollton Station to the line was not simple, for several reasons. First, there was no track connection between Riverfront and the rest of the streetcar trackage, and second, no connection was practicable because of the six inch difference in track gauge. So not only did the streetcars have to be moved, but they had to change trucks to ones equipped with standard gauge wheelsets. Fortunately, when they were built, the axles and trucks were designed so that changing between standard gauge and wide gauge was relatively easy. Perley Thomas car 451 awaits departure time for its next upbound trip, at the Esplanade end of the line, February 16, 1989. — © 2001 Peter Ehrlich; used with permission. Looking from Jackson Square, photographer Peter Ehrlich snapped this view of car 450 heading uptown (upriver) on the single track Riverfront Line, February 16, 1989. — © 2001 Peter Ehrlich; used with permission. The two ex-Melbourne W-2 cars on the Riverfront Line in February 1989. The upper picture shows the side of car 452 that faces the loading platforms at the station stops, the side away from the river. This side had two doors, wide enough for wheelchair access. The river side of these cars had no doors, as can be seen in the lower picture, showing the river side of sister car 454. Both cars are upbound, i.e., heading upriver. The freight track is prominent in the foreground of the lower picture. — © 2001 Peter Ehrlich; used with permission. There was a pair of small sidings for car storage and light maintenance, sometimes called Canal Yard, on the downriver side of Canal Street. The upper picture shows Perley Thomas car 451 working past the sidings on its way uptown, with Thomas car 450 (at our left) and ex-Melbourne 452 in the yard on Friday, February 17, 1989. The school bus filled with children on a field trip is from St. Bernard Parish, the next parish down the Mississippi River from New Orleans (Orleans Parish). The lower picture features car 451 on the inspection track; the reflection shows us that water has filled the inspection pit. This is a common problem in New Orleans anywhere one digs. — Upper photo © 2001 Peter Ehrlich, used with permission; lower photo by Earl Hampton. Contrary to many people's expectations, the Riverfront line proved to be an immediate success both with tourists and with New Oreleanians. In fact, it was so successful that the single passing siding in the middle of the line was insufficient to handle the crowds of riders. So in 1990, Riverfront was temporarily closed, and a second track was constructed over the entire length of the line, which was extended another half mile. Two additional streetcars were added to the fleet: a third ex-Melbourne car, number 331 renumbered 455, and a third Perley Thomas car, 952, renumbered 456. Pictures 69.2, 69.4, 69.6, and 69.8. In the upper photo, car 451 is at the Canal Street stop, heading upbound, on March 4, 1991. The lower picture features car 456 near the Bienville Street stop, also upbound, February 8, 1992. — © 2015 Peter Ehrlich; used with permission. The ADA requirements for wheelchair accessibility came to be applied to all cars of the Riverfront line, not merely some of them. RTA decided to create a series of accessible Perley Thomas cars. As a prototype, car 957 was stripped, and a wheelchair door was cut into the side of the car. The main problem was the fan reaction: fans were horrified at the idea of making such a major modification to the antique streetcars, and they let RTA know it! Rather than put the earlier cars through this process, RTA then decided to build entirely new car bodies at the Carrollton Station shops. At the same time, it was decided to regauge the Riverfront line to wide gauge to conform to the St. Charles track gauge, and to build a connecting track down Canal St. from St. Charles to Riverfront. This would make it much easier to service Riverfront cars at Carrollton Station, and they could even be housed at Carrollton rather than out in the open at the ends of the Riverfront line. To equip the new cars, nine PCC cars were acquired from Philadelphia, which uses almost the same wide track gauge as New Orleans (¼" less than the 5'2½" of New Orleans). The plan was to use the motors, controls, and trucks from the PCC cars in the new “Perley Thomas replica” cars being constructed. Car 957, now renumbered 457, and new car 458 were so equipped. RTA also investigated the possibility of buying new-looking, modern streetcars from the Czech builder CKD Tatra. A loan of a demonstrator car was arranged, and the car was actually run briefly in New Orleans. Ultimately, it was decided to equip all seven of the new cars (457-463) with modern trucks and controls from the Czech Republic. All of the Philadelphia cars and equipment were sold or scrapped. The last day of standard gauge operation of Riverfront was September 6, 1997, after which the line was again closed and the track gauge changed. This also marked the retirement of cars 450-452 and 454-456. The former Melbourne cars were sold to the Memphis Area Transportation Authority (MATA) and rebuilt by Gomaco before being put into service in Memphis. (Car 452 was destroyed by fire while in service in Memphis, November 4, 2013.) Cars 450 (924) and 451 (919) were stripped of many parts, used in building new cars 458-463. Car 456 was restored to its historical form, and was again numbered 952, then was sent to San Francisco on long term loan to the Municipal Railway. Riverfront was reopened December 7, 1997 with wide gauge track running the new cars 457-463. Pictures 81.2, 81.3, 81.4, 81.6, and 81.8. Pictures 82, 83, and 84. Car 957 had its own odyssey after its retirement in 1964. Though records are scanty, it appears that it went initially to the Trinity Valley Railroad Club in Weatherford, Texas, west of Fort Worth. But that group was unable to continue to house the car, and sold it to the Spaghetti Warehouse Company for use in their spaghetti restaurant chain. However, it was discovered that the car was too tall to fit into the intended building, and the plan was abandoned. The McKinney Avenue Transit Authority in Dallas entered the picture, and traded the Spaghetti Warehouse two Dallas streetcars for the 957. MATA workers then rushed to the scrapyard where the trucks and operating equipment were standing on a flatbed trailer waiting to be unloaded and dismantled. Fortunately, the truck had gotten stuck in mud, and the equipment had not been unloaded. MATA was just in time to save it. When New Orleans RTA asked to buy the car back, MATA agreed, and used the proceeds to buy another streetcar and spare parts for its fleet. Car 460 is seen on St. Charles Street at Lafayette Square on its return trip from Riverfront service to its home base at Carrollton Station, August 1, 1998. It is followed in the distance by a green Perley Thomas 900-class streetcar on the St. Charles Line. — © 2001 Peter Ehrlich; used with permission. Part of the project of restoring the Canal Line was the construction of a Service, Inspection, and Storage (SIS) facility at Canal Station behind the A. Philip Randolph building. After the Canal Line reopened, the seven Riverfront cars were stationed at Canal rather than at Carrollton. Major repairs, repainting, etc. were still to be done at Carrollton Station. Hurricane Katrina was very hard on the New Orleans streetcar system. When it arrived on August 29, 2005, most of the Riverfront cars were tucked away at Canal Station, along with the cars of the newly restored Canal Line. The floods that followed drowned all thirty cars (24 Canal cars and 6 of the 7 Riverfront cars), ruining their motors and electronic controls. Car 461 had been at Carrollton Station for repainting. It and the 35 St. Charles cars escaped damage from the storm and flooding. However, the overhead lines and power system for St. Charles were severely damaged, and had to be rebuilt before streetcars could again run on St. Charles. On the other hand, the Canal and Riverfront lines escaped serious damage, although replacement power had to be found for Canal. A timely loan from the Massachusetts Bay Transportation Authority solved that problem. Permission was solicited and received to use the venerable Perley Thomas streetcars on Canal and Riverfront, despite their lack of wheelchair facilities. Operation of the green St. Charles cars on Canal and Riverfront began December 18, 2005. Car 461 had ridden out the storm at Carrollton Station, awaiting repainting. Eventually, it emerged from the paint shop in a unique blue and yellow livery, and was put back to work on Riverfront. This did not last long; when a problem arose with its controls, it was sent back to the station, and was withheld from service. It was planned to repaint the car in the red livery before returning it to service. In early December 2007, it was reported that Brookville Equipment Co., the company which had provided the trucks and control systems for the Canal cars, had been given the contract for the components necessary to rebuild all 31 damaged streetcars: the 24 Canal cars and all 7 Riverfront cars, including the 461. Installation, including rewiring of the cars, was to be done on site at Carrollton Station shops. Repainting of the cars at Carrollton was already under way. It was stated that the trucks would be remanufactured at the BEC facility in Brookville, PA. The project began in early 2008, and was expected to take three years. As of mid-January 2009, cars 2004 and 2008 through 2015 were all available for service, and were being used on the Canal and Riverfront lines. By mid-June, the last few cars were the 2003, 2005, and 2006. Cars 457-463 were scheduled to be refurbished next; by the beginning of July, that work was under way. Perley Thomas cars were no longer seen in service on Canal Street or Riverfront, although they were still housed at Canal SIS, and the St. Charles car line was operated from that facility rather than from Carrollton Station. The result of the rebuilding is that all of the red “Perley Thomas replica” cars (2001-2024 and 457-463) have the same trucks and controls: Brookville trucks with upgraded Saminco drives and TMV control systems. In July 2009, streetcar service on Canal Street was shut down (with bus replacement) for what was expected to take two months, while underground electrical lines damaged by Hurricane Katrina's floodwaters were replaced. During this period, the St. Charles and Riverfront cars were housed at Carrollton Station, and those two lines were operated normally from there. After the return of the Canal Line to service, St. Charles cars continued to operate from Carrollton Station. On January 3, 2010, car 462 became the first of the 457-463 series cars to return to active service, followed by 457, 458, and 459 on March 8, 15, and 14, respectively. Car 463 was spotted at the Brookville plant in Pennsylvania in 2006, where it had been sent for evaluation. When Katrina hit, retired cars 450 and 451 were partially dismantled, with plans very vague for their future. As of early 2008, the condition of the two venerable cars is as seen here, in storage at Carrollton Station. The upper pair of views shows car 450, ex-924, stripped down to its ribs, and the lower pair shows 451, ex-919, not quite so completely disassembled. No work on either of them is currently contemplated, at least until the 457-463 and 2001-2024 groups of cars have been rebuilt and placed back into service. That's 2011 next to 450 in the top view; it has since been repainted. The third picture shows repainted car 2002 next to 451, with some 900-series cars visible at the left. — Top photo by the author, taken May 23, 2007; second and fourth photos by Earl Hampton, taken Feb. 12, 2008; third photo © 2008 Peter Ehrlich, taken Aug. 9, 2008, used with permission. Pictures 133, 134, and 135. Pictures 137, 138, and 139. Pictures 140, 141, and 142. Effective Sunday September 30, 2018, service on the Riverfront line between Canal Street and the French Market end of the line is being provided by Canal Street cars. Due to construction on the World Trade Center building, service is suspended between Canal Street and the Julia Street end of the Riverfront line. Riverfront cars are seen from time to time serving the Canal Street line. Text, captions, photos by the author, and photos by Richard & Joseph Braun (the Braun Bros.) © 2007, 2008, 2009, 2010, 2011, 2012, 2013, 2015, 2018, 2019 H. George Friedman, Jr. Photos by Earl Hampton © 2006, 2007, 2008, 2009, 2010 Earl W. Hampton, Jr. Photos by Peter Ehrlich © 2001, 2002, 2008, 2015 Peter Ehrlich. All rights reserved. Permission is hereby given for the QUOTATION of SHORT excerpts, as long as credit is given to H. George Friedman, Jr.